Prevent & Fix works with the body on skeletal alignment in Scottsdale, AZ in accordance with making the muscles healthy, thus holding the new alignments. Poor posture when sitting and standing can lead to a number of medical conditions, including lower back pain and sciatic pain. 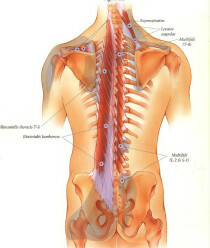 This is due to a misaligned spine putting stress on surrounding muscles in the back and other parts of the body. Therefore, it must be a conscious effort when sitting or standing to keep the spine from misaligning itself. Exercises like yoga, Pilates, core strengthening, stretching and good posture help to prevent a misaligned spine. However, once a spine is misaligned, noticed by pain, numbness or tingling in the lower back and/or legs, it is important to get this corrected before incurring any injuries. At Prevent & Fix, Grigor works to not only align the spine, but also strengthen the muscles around the spine to hold the alignment and prevent further misalignments. His work is crucial in rejuvenating muscles around the spine and legs and making them healthy and strong. Lose pain and discomfort and prevent injuries with Prevent & Fix.